Quick update on the site: I’ve been working on a review compilation of a complete series of videogames, so that’s the explanation as to why no review has been up for a while. (Playing through 5 games takes longer than 1, it turns out) That review will be up by next week and the reviews will return to a more steady stream of output. (1 article per week) That is all. but it should be noted that the lesser known characters are very well realized in terms of animation and creativity. This leads to the first problem with Darkstalkers – balance. Some fighters are just, plain-and-simple, leagues better than others at fighting. The mummy Anakaris, for example, is just way too slow and unwieldy and doesn’t have enough other qualities to stand a good chance amongst the relatively fast assortment like Lord Raptor (the rock-and-roll zombie) or even medium speed ones like Pyron (the living flame demon, who may be one of the coolest characters ever designed). On the plus side though, is the fact that if you’re playing this, you’re kind of limited in terms of mode of play. The online aspect of the game is actually really smooth if you can find an opponent. But that’s the key word, “if”. The fact that the game is a digital-only release, means that the audience for such a niche fighter is already small, made worse by the fact that the game’s been out for a while now. The best way to play it though, regardless, is going to be with another person actually in the room. It is immensely fun to dig into this game with a friend. You’ll be getting constantly surprised by what the insane move set has to offer and will have more “that was so cool!” moments than most fighting games can offer newbie players. This is a fighting game that is instantly fun to play, regardless of skill level. The single player offering is roughly what you would expect from older titles. Both games have their own ladder modes, complete with unique, often hilariously bad, endings for each character. The story is so hard to understand due to the lack of context provided to the player that one can’t help but burst out laughing at the fact that Felicia is a nun in one of her endings. But, i digress, the ladders are a good way of getting a feel for your character, and to test your ability against some of the most frustrating AI in existence. Blocking protects from almost all damage, and the computer opponents will be able to execute nano-second timing, before unleashing a combo on you in return. The cheapness can be dulled fortunately, by going to the difficulty setting and dropping it. Even on the lowest settings, though, opponents in Night Warriors can still give you a run for your money, if you’re trying to get the trophy/achievement for no-deaths in each game’s ladder modes. It’s not the worst example of super-cheap AI from an arcade fighter, but it’s definitely up there. Speaking of uber-difficult trophies, the game has some of the worst, most obtuse achievements ever. Trophies are almost entirely comprised of Night Warriors’ Challenges mode. Which is basically where the fun of Darkstalkers gets turned into soul-crushing tedium before sapping your interest in trying to collect the trophies at all. Why? Because the challenges require the player to do a series of complex combos for each character. The frame-by-frame specificity that the game asks of you is laughably ridiculous, as most of the challenges will leave you feeling angry and confused as you attempt to perform inhuman inputs that the computer manages to make look easy. I personally enjoy when games provide challenges for the player, but these literally ruin the game. The fact that their only worth Bronzes (or 10g, for Xbox) makes them completely unrewarding torture. Stay away from these. If you’re a trophy hunter, give it a shot. But you’ll soon find yourself with the feeling that you’re really just wasting your time trying to complete the game’s asinine requests. 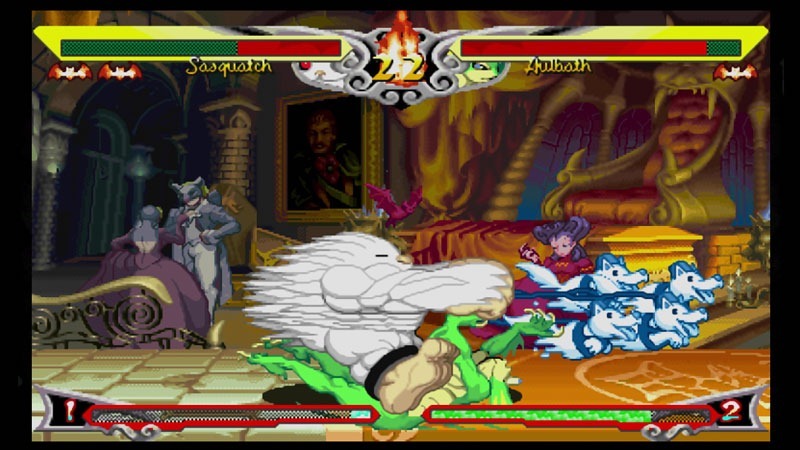 Darkstalkers Resurrection is a refreshing facelift for the older games. It’s a genuinely fun couple of fighters that don’t take themselves too seriously and doesn’t mind being full of colorful oddities. It’s got its flaws, but the couch competition is where the player-versus-player shines. The online is relatively dormant, sadly, and the ladder mode isn’t the most engrossing thing ever, but that doesn’t make it a game not worth experiencing. Playing what is essentially the Monster Mash videogame, complete with the swamp monster, abominable snowman, and vampires galore, makes this one of the most creative, as well as stylish, fighting series Capcom has ever released. The gameplay is approachable, the animation is amazing, and the Vault is full of character art to ogle at. Handicapped by inactivity online and a truly awful bunch of trophies, Darkstalkers Resurrection’s pros still manage to outweigh its cons. The one other point of contention however, is the pricing. I actually snagged this title while it was on sale on PSN for half-off, but the game is normally priced at $15, which can be enough to make some of the more frugal among us lose interest immediately. However, if you can look past that somewhat high cost of entry, or if you just have 15 bucks burning a hole in your PS store wallet, then this title will not disappoint. Darkstalkers Resurrection is an imaginative take on those classic horror-movie staples, and a perfect game for Halloween (or whenever you and some friends want some goofy entertainment).